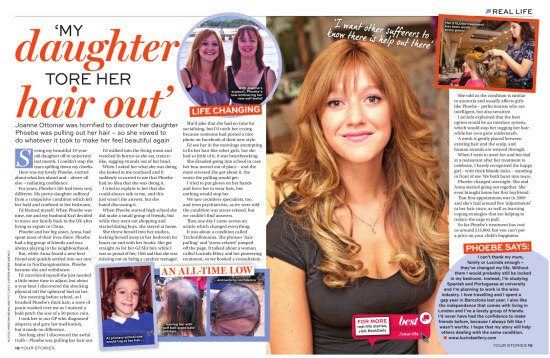 An article in Best magazine's Real Life section describing how Joanne Ottomar discovered her daughter Phoebe was pulling out her own hair and how the treatment and advice they received from Lucinda about Trichotillomania has solved the problem and turned Phoebe from a reclusive teenager into a confident young lady. Joanne Ottomar was horrified to discover her daughter Phoebe was pulling out her hair – so she vowed to do whatever it took to make her feel beautiful again. Seeing my beautiful 19-year-old daughter off to university last month, I couldn’t stop the tears spilling down my cheeks. Here was my lovely Phoebe, excited about what lies ahead and – above all else – radiating confidence. For years, Phoebe’s life had been very different. My pretty daughter suffered from a compulsive condition which left her bald and confined to her bedroom. I’d blamed myself. When Phoebe was nine, me and my husband Karl decided to move our family back to the UK after living as expats in China. Phoebe and her big sister, Anna, had spent most of their lives there. Phoebe had a big group of friends and was always playing in the neighbourhood. But, while Anna found a new best friend and quickly settled into our new home in Northamptonshire, Phoebe became shy and withdrawn. I’d convinced myself she just needed a little more time to adjust, but about a year later I discovered the shocking physical toll the upheaval had on her. One morning before school, as I brushed Phoebe’s thick hair, a wave of panic washed over me as I noticed a bald patch the size of a 50 pence coin. I took her to our GP who diagnosed alopecia and gave her medication, but it made no difference. Not long after I discovered the awful truth – Phoebe was pulling her hair out. I’d walked into the living room and watched in horror as she sat, trance-like, tugging strands out of her head. When I asked her what she was doing, she looked at me confused and it suddenly occurred to me that Phoebe had no idea that she was doing it. I tried to explain to her that she could always talk to me, and this just wasn’t the answer, but she hated discussing it. When Phoebe started high school she did make a small group of friends, but while they went out shopping and started dating boys, she stayed at home. She threw herself into her studies, locking herself away in her bedroom for hours on end with her books. She got straight As for her GCSEs but, while I was so proud of her, I felt sad that she was missing out on being a carefree teenager. She’d joke that she had no time for socialising, but I’d catch her crying because someone had posted a nice photo on Facebook of their new style. I’d see her in the mornings attempting to fix her hair like other girls, but she had so little of it, it was heartbreaking. She dreaded going into school in case her bun moved out of place – and the more stressed she got about it, the worse the pulling would get. I tried to put gloves on her hands and force her to wear hats, but nothing would stop her. We saw countless specialists, too, and even psychiatrists, as we were told the condition was stress-related, but we couldn’t find answers. Then one day I came across an article which changed everything. It was about a condition called Trichotillomania. The phrases ‘hair-pulling’ and ‘stress-related’ jumped off the page. It talked about a woman called Lucinda Ellery and her pioneering treatment, so we booked a consultation. She told us the condition is similar to anorexia and usually affects girls like Phoebe – perfectionists who are intelligent, but also sensitive. Lucinda explained that the best option would be an Intralace system, which would stop her tugging her hair while her own grew underneath. A mesh is gently placed between existing hair and the scalp, and human strands are weaved through. When I went to meet her and her dad at a restaurant after her treatment to celebrate, I barely recognised the happy girl – with thick blonde locks – standing in front of me. We both burst into tears. Phoebe changed overnight. She and Anna started going out together. She even brought home her first boyfriend. That first appointment was in 2009 and she’s had around five ‘adjustments’ to her hair since, as well as learning coping strategies that are helping to reduce the urge to pull. So far Phoebe’s treatment has cost us around £15,000, but you can’t put a price on your child’s happiness. I can’t thank my mum, family or Lucinda enough – they’ve changed my life. Without them I would probably still be locked in my bedroom. Instead, I’m studying Spanish and Portuguese at university and I’m planning to work in the wine industry. I love travelling and I spent a gap year in Barcelona last year. I also like the independence that comes with living in London and I’ve a lovely group of friends. I’d never have had the confidence to make friends before, because I always felt like I wasn’t worthy. I hope that my story will help others dealing with the same condition.